Kickstarter is probably the most inspiring and creative place on the earthly web right now and when it comes to smartphones, accessories and fun tech in general, it should be among your first stop shops. Technically, Kickstarter is not a shop - it’s a community driven, contribution-based platform to get your ideas into real life. The good ideas usually get lots of attention and money, and the bad simply fail, just as it should be. The awesome thing about Kickstarter is that you get to chose what is good and what is bad. We’ve hand-picked our favorite projects and you can see that we found it hard to contain ourselves. So we narrowed it down to 20 projects. These are Kickstarter’s brightest ideas related to smartphones and tablets, all in a single post. Some of the projects have already been funded, others are still looking for that precious cash and you can step in and help. Sadly, we couldn’t include everything and some brilliant projects like the Printrbot, the first affordable 3D printer, or the extremely fun and creative Desktop Jellyfish Tank, and many, many others as they have little direct relation to our mobile world. But we’re almost sure you’ll get bitten by the Kickstarter bug after you check the ones below, so with no further ado here is our selection of most inspiring mobile gadgets and accessories. Don’t hesitate to tell us about your favorites in the comments below. 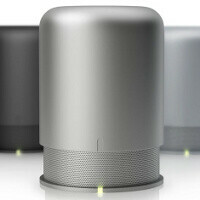 The Hidden Radio is probably the best-designed external speaker for a mobile device. Twist and lift the cap to get started, and the more you left, the louder the volume. It goes to 80dB, and it’s	enough to fill an entire room. Dieter Rams-inspired to the bones, this Hidden Radio seems eternal with its design. $99 will get you started with one. A smart watch is a dream for some, but for Kickstarters it’s a reality. A mere $25 will get you the strap where you can tuck in your iPod nano and have all of its computing power on your wrist. With almost a million in funding, this is one of the most successful and simple Kickstarter projects. Recoil Winders is officially the neatest and most fun way to store your cables. It’s a crod winder that automatically winds up “almost all cables that clutter our world.” A mere $8 will get you the smallest Recoil Winder. This extremely well crafted dock looks like it’s made by Apple. It does one thing better than the standard stands - allows you to easily undock your iPhone and this brought it nearly $1.5 million in funding. When it looks like the iPad Smart Cover, functions like the iPad Smart Cover and costs almost as much as it... well, it’s not the Smart Cover, but it’s almost exactly like it. For a mere $19, you get a colorful case that you can wrap your headsets in and it’s awesome. While it originated as a stand for the curvy original iPad, the PadPivot is still one of the best minimalistic stands for tablets and allows you to securely place and tilt your tablet on your leg. $25 or more pre-orders you one. What if you take a gorilla tripod and equip it with wheels? It becomes Cineskates, an awesome tool for getting creative with your shots. Glif is one of the first Kickstarter projects we covered and it caught our eye with its simplicity. It’s a photographic stand for iPhones that mounts to standard tripods. Node is probably the most inspiring smartphone project we’ve seen on Kickstarter as it augments the smartphone experience tremendously. It brings a range of sensors including standards like three-axis accelerometer, gyroscope, but also life-saving gas detectors, and others. For those of you that just can’t go anywhere without their smartphone, the AQUA TEK S waterproof case is an opportunity... to shoot pictures and videos underwater. $100 and you can submerge yourself in the underworld of iPhone photography. Capta is much like the Glif photographic mount and stand except it’s universal. It will work with iPhones, Samsung Galaxy devices, BlackBerries, feature phones - everything that has enough of a back plate to fit it. Capta uses extremely strong adhesive to keep your phone steady even vertical. If you’ve ever dreamed of a combination between a standard pen and capacitive stylus, dream no more as it’s here. The LunaTik TouchPen could be yours for $30 and it functions just as you’d expect a capacitive stylus to work. With CloudFTP you can easily share contents of USB storage devices with your iOS device. One of the biggest hurdles to notebook-like productivity on tablets is no longer the silicon - it’s the lack of a keyboard with physical feedback. And TouchFire brings you exactly this without you having to carry a heavy external keyboard. Simple as it sounds, colors are what can make or break a product. Nokia is building its whole strategy on colorful smartphones, and while Apple has opted for the traditional black and white, a splash of blue, yellow or green won’t hurt. Juicies brings all those colors and more to your iOS device cables. GoPano micro is another awesome tool for mobile photographers allowing you to take 360 video easily with your iPhone. Dot is a “stylish, durable and downright pocketable panoramic lens attachment” for the iPhone 4/S and it’s got an app to go along with it. Romo is a smartphone controlled robot with an affordable price tag and plenty of space for your experiments and it costs $78. Like a geek-Wolverine,the tablet claw will make it easier to geek out for hours on end, holding your tablet with just one hand. The Olloclip is basically a wide-angle and fish-eye lens for the iPhone 4/S. It’s very pocketable, and gives your photos an additional perspective. Interesting. All those selected "creative" projects are based on aesthetization of everyday life in Apple's products, the trend that has been obsessively followed for the last couple of years. It's basically conversion of everything from life in iOS-applicable objects and trying to belong to that visual paradigm. Very creative indeed. I like the elevation dock...It would be great to have.